The Casa Birre III in Portugal is the brainchild of Areacor Projects & Interiors, based in Estoril. This beautiful feat of modernity is a home with a sense of inspiration from the future. Today we have the privilege of taking a tour around the house and its lavish interiors. 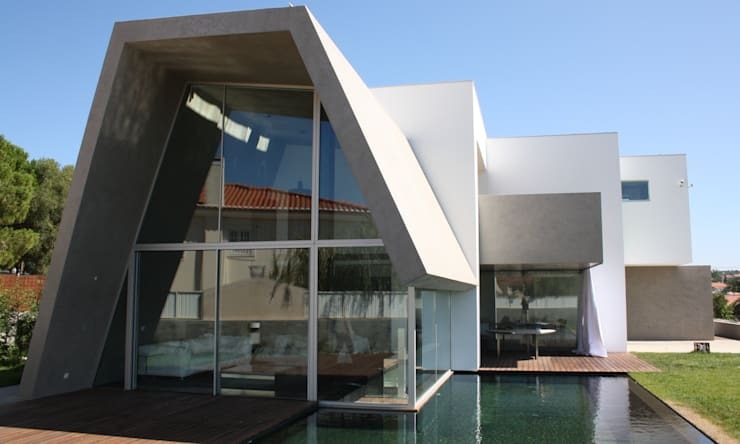 Casa Birre III was completed in 2010 in Cascais, Portugal. As we will see taking a closer look at the house and its interiors, it is a very strong modern design achieved by complicated angles brought about by several geometric volumes stacked upon one another. Although the interiors have some ultra-luxurious elements, it has a clear underlying minimalist style. Join us to explore this project a little more in-depth. The first sight we see of this spectacular house reveals the complex angles and geometric structure of the building. This gives the home a particular futuristic appearance, accentuated by the use of white and grey painted concrete and a surplus of glass. Here we can see a spacious living area separated only by a glass wall from a wooden deck and swimming pool that bends around the edges of the house like a puzzle piece. In fact, the whole structure and its surroundings look like a puzzle that has been assembled with professionalism and great care. The end result is immense depth and ample details to keep the eye busy. When we step into the house, we are greeted by a clean and minimal interior. 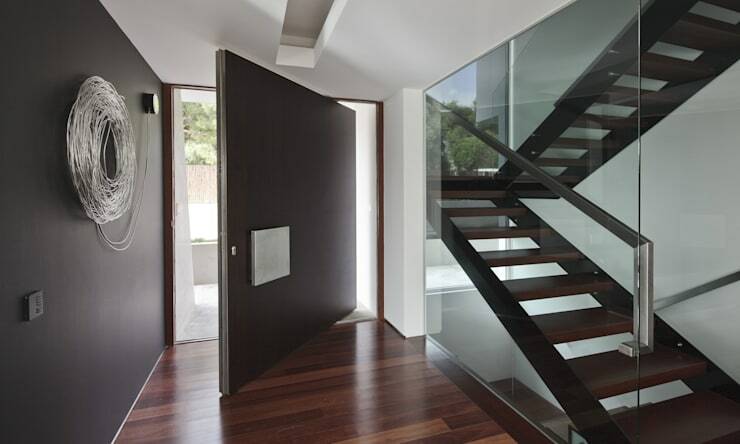 The large, cubic door swings effortlessly into the home. The polished wooden flooring gives a sleek, yet elegant look as first impression. 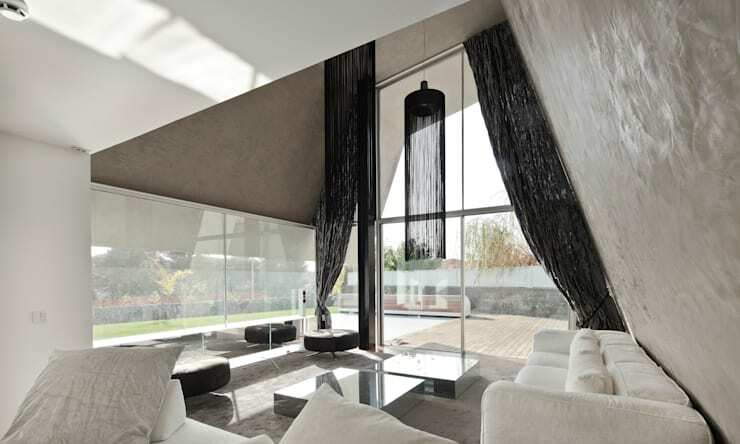 A colour-blocking effect is achieved by the wall on the left in a rich charcoal colour, while the ceiling and other walls are brilliantly white. The front door is painted in the same charcoal hue. The right wall of the entrance hall is made of glass, through which we can see a half-landing staircase to the upper level, and which also leads down below ground level. The space is almost completely devoid of ornamentations, save for a decorative light on the left wall, made of steel wire. This emphasises the minimalist style of the interior, but also adds a touch of artistic design. Moving deeper into the interior, we can see very large, impressive spaces. Let's go into the living room first. 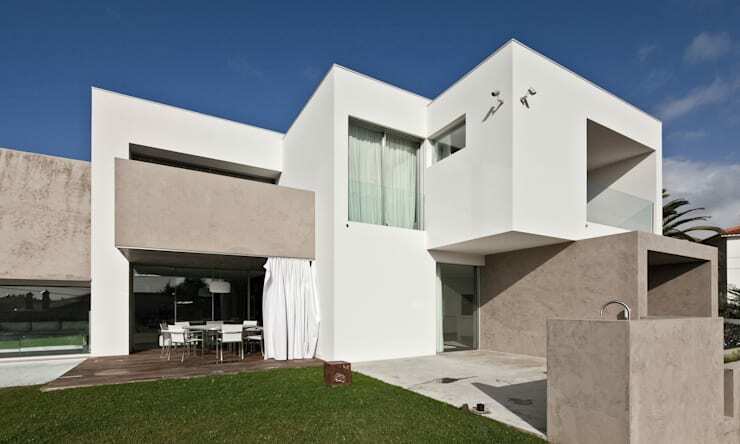 Here we can see how the geometric structure of the buildings create interesting angles and corners inside the house. This is especially true for the living room, which is nestled inside he glass section of the house and topped by the trapezium-shaped roof. The room is furnished in a monochromatic colour palette of whites and black. Subtly differentiating hues of white are used for the walls, ceiling, rug and sofas. This is then complemented by larger-than-life black drapes, a black chandelier, and black ottomans. In addition to this, the space is rounded off by mirrored coffee tables, which brings us back to the futuristic feel. Although it may be difficult to tear your eyes away from that bold living room, let's take a look at what the dining room has in store. The room is overwhelmingly white, as to adhere to the minimalist style we were introduced to when entering the home. A carpet of the same colour and quality seen in the living room is utilised here, giving the room a warmer and more comfortable feel than only the wooden flooring. The dining table is made of steel and glass, ensuring transparency and making the space feel bigger. The accompanying white chairs have much of the same effect. Lighting consists of recessed ceiling lights with the addition of a bold floor lamp, and this is all set against a backdrop of an artistic photographic print on the back wall. It isn't surprising that the kitchen is also almost entirely white. This is very appropriate for the space, since it gives a feeling of cleanliness and potential for many marvellous meals. A white kitchen is also beneficial in the sense that it is easier to identify mess or dirt and then clean it. 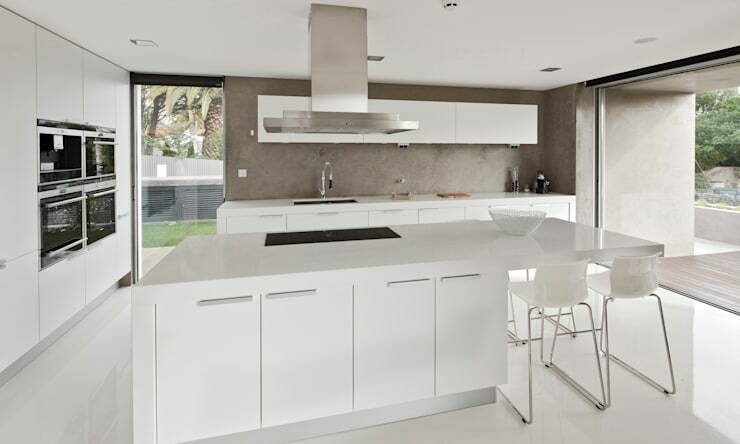 If you are considering an all-white kitchen, you might like to take a look at: The White Kitchen – Yay or Nay? The back-splash area of the kitchen counters we see at the back is in a neutral, stone colour, which provides an interesting visual contrast to the white ceiling, floor, cabinets and counters. The kitchen appliances are integrated into the cabinets and counters for a streamlined effect, and there are large windows to allow ample light to enter the area and fill to work spaces. So we've seen much of the home's interior, which is certainly as impressive as the façade, but why don't we go outside for one last look at the bold structure of the home. This time we'll take a look at it from a side angle, in order for us to get a view of the porch and entertainment area. Next to the glass walls of the living room and behind the swimming pool we find a veranda perfect for outdoor dinners. This convenient alcove is furnished with patio chairs and a dining table, and the space can be enclosed by curtains when the weather gets a bit nippy. To the right we see another concrete court to be used as needed for outdoor activities, and this runs directly onto a generous lawn for recreation. The home from the future has room for play too! What did you think of this home's futuristic character and geometric spaces? Share your thoughts with us!